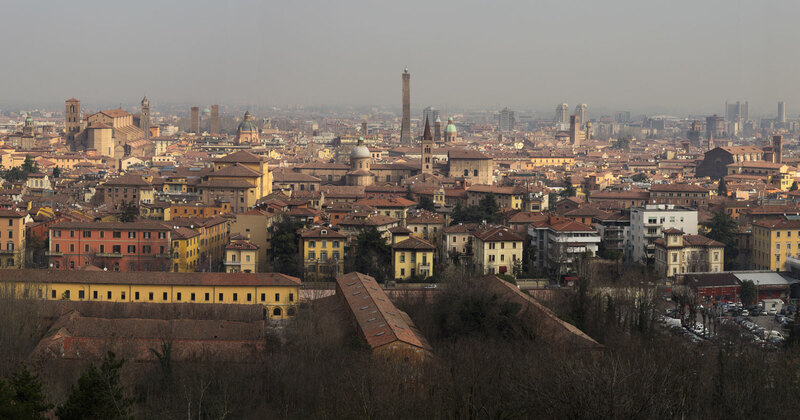 The provincial capital of the Emilia Romagna region, Bologna is located between the Tuscan-Emilian Apennines and the heart of the Po Valley. A meeting point between north and south, east and west. From Bologna easily reaches the Adriatic Riviera as well as Venice, Florence, Milan and Rome. Bologna is a city of art, culture and commerce and it is well-known for the nearly 40 km of portico, the longest in the world. Also called "Dotta" because of its ancient university, and the "Grassa" for its gastronomy, the city boasts the title "Creative City of UNESCO Music" and boasts a medieval center among the most extensive and best preserved Of Europe, crowded with pubs, theaters and shops. Patriarch of great artists including Giorgio Morandi, Guido Reni, Carracci, Guercino, Aspertini, has attracted illustrious characters such as Mozart, Carducci, Dante, Rossini and the Nobel for Physics, Guglielmo Marconi. How to reach Bologna City Centre? You can directly arrive at Bologna Airport. The international airport is about 6 Km far from Bologna city centre. More information about the airport in Bologna can be found here. From the airport, you can take a taxi or the Aerobus- BLQ shuttle service. Aerobus is a shuttle service run by TPER, Bologna's local transport company, connecting Bologna Airport with the railway station. One-way ticket from/to the Airport costs € 6.00. Aerobus takes about 20-30 minutes and runs every 11 minutes. Tickets can be purchased directly on the website, from the automatic vending machines located in the airport, and in Bologna at the Central Railway Station (at the Aerobus departure point) or at the TPER ticket offices. The ticket can also be used on all public transport in the Bologna urban area within its 75 minutes of validity. For more information you can visit the web site here. You can now arrive at Bologna Central Station, thanks to high speed trains, in half an hour, from Florence, an hour from Milan, in an hour and a half from Venice, in 2 ½ hours from Rome, in 5 hours and 45 minutes from Bari. Visitors coming to town by car must bear in mind the Limited Traffic Zone (ZTL), a large area located within the historical center of Bologna where circulation of motor vehicles is daily restricted from 7 a.m. to 8.00 p.m. The entrances to the ZTL area are monitorated by Sirio "the electronic traffic warden". Visitors coming to the city by car can find very convenient car parks, well connected with public transports or take advantage of the large underground parking areas and several garages in the historical center. For more information you can visit here. How to reach Prodi Lecture Hall? From the railway station, you have to take bus 30 (direction "San Michele in Bosco"). Passengers have to disembark at Piazza Minghetti and successively reach the Prodi lecture hall (Piazza San Giovanni in Monte, 2) by a walk (about 4 minutes). How to reach the Department of Agricultural and Food Sciences? From the railway station, you have to take bus 35 (direction "Rotonda Baroni") and disembark at the "Facoltà di Agraria" stop. The trip take about 30 minutes. From the city centre, you have to take bus 20 (direction "Pilastro"), disembark at "San Donnino" stop and take bus 35 (direction "Rotonda Baroni") or 55 (direction "Rotonda Baroni") and disembark at the "Facoltà di Agraria" stop. One hour regular TPER ticket cost € 1.50. Tickets can be purchased at the TPER ticket offices or in the authorized shops. For more information you can visit the TPER website: http://www.tper.it/. Everyone entering Italy must have a valid passport, or in the case of European Union Member States, a national identity card. Visas are required for some countries. Participants are responsible for their own accommodation during their stay. Special price reserved to participants of the 1° International Conference of Wheat Landraces for Healthy Food Systems. For reservation, please use the promo code WLHFS for the direct booking at https://www.hotelmetropolitan.com/en/. If you have any problems in booking your room, please contact booking@hotelmetropolitan.com and specify your promo code WLHFS. For general enquiries please contact reception@hotelmetropolitan.com. Special 10% discount on the daily rate reserved to participants of the 1° International Conference of Wheat Landraces for Healthy Food Systems. For reservation, please contact reservation@aemiliahotel.it and specify your attendance at the Conference. Special 10% discount on the best rate published at http://www.iporticihotel.com/en reserved to participants of the 1° International Conference of Wheat Landraces for Healthy Food Systems. For reservation, please contact reservation@iporticihotel.com and specify your attendance at the Conference. Special 10% discount on the best rate published at www.hotelaccademia.com reserved to participants of the 1° International Conference of Wheat Landraces for Healthy Food Systems. For reservation, please contact hotelaccademia@hotelaccademia.it and specify your attendance at the Conference. Special 15% discount reserved to participants of the 1° International Conference of Wheat Landraces for Healthy Food Systems by showing your conference badge. Special 10% discount reserved to participants of the 1° International Conference of Wheat Landraces for Healthy Food Systems by showing your conference badge. Only open on Thursday, June 14. A unique tasting experience with a special menu by chef Mario Ferrara in an unexpected VII century's vegetable garden hidden in the city center. 50 euro wine included. Reservation required. Please call 051 263404 or 366 7180306, or email info@ristorantescaccomatto.com.